Each itinerary is tailor-made to suit your personal requirements so please call us today with your preferences. Depart from your regional airport for your flight to Abu Dhabi. On arrival you will be met and taken by private transfer to your accommodation. 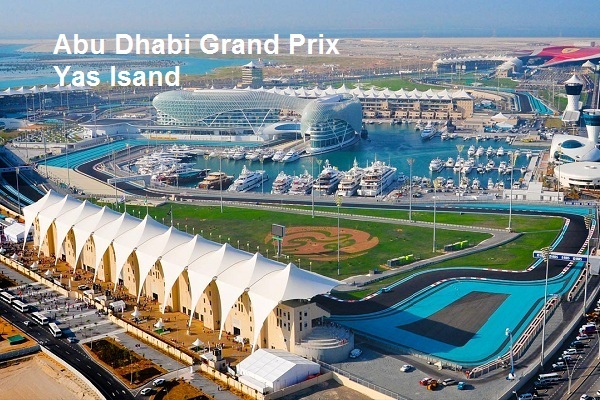 Day at leisure to explore Abu Dhabi or make you way to Yas Island circuit for practice session. Private transfers can be arranged to suit you personal requirements. Make your way to Yas Island circuit for the qualifying sessions. Private transfers can be arranged to suit you personal requirements. Make your way to Yas Island circuit to watch the 2018 Abu Dhabi F1 Grand Prix and supporting events. Private transfers can be arranged to suit you personal requirements. Day at leisure until your private transfer to the airport for your flight to your regional UK airport. You have the option to extend your stay in Abu Dhabi, or transfer to Jebel Ali Beach Resort or one of our preferred accommodation on Jumeirah beach . The exclusive Sofitel Abu Dhabi Corniche boasts an impressive setting in a skyscraper overlooking the Dhow Harbour and Arabian Gulf. The remarkable Grand Mosque is a 20-minute drive away, while the main business and embassy district is 15 kilometres from the hotel. The chic and contemporary rooms feature a lavish art deco style and large windows with sweeping views. Guests can indulge in 24-hour room service that can be ordered via the in-room interactive television, or dine in one of three onsite restaurants serving delectable seafood, Thai, and innovative international fusion cuisine. The wellness centre provides separate saunas, hammams and Jacuzzis for men and women as well as a fitness centre with a personal trainer and an expansive heated outdoor pool where guests might spend lazy afternoons lounging with a drink from the pool bar. This hotel’s exquisite design and attentive services make for an unforgettable stay in Abu Dhabi. As Yas Island Abu Dhabi’s premier hotel, Yas Viceroy Abu Dhabi sets the standard for exceptional service throughout its 499 impeccable rooms and suites, 11 innovative dining and lounge venues, and the luxurious ESPA at Yas Viceroy Abu Dhabi. The interiors of this Abu Dhabi resort embody a contemporary fusion of elegance and momentum, created with sensuous curves and sleek lines. 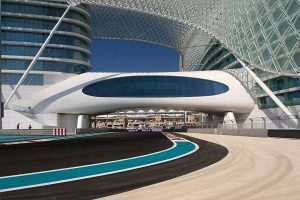 Guests marvel at the incredible LED canopy that not only emits a concert of color and shade but also embraces the exhilarating Yas Marina Formula 1™ Circuit, defining the Abu Dhabi hotel as a landmark across Yas Island and one of the world’s most extraordinary destinations. Watch high-speed races and practices from the hotel daily or layout on the beach for a relaxing sunny day. Delight in the art of cuisine at Yas Viceroy Abu Dhabi. When you are dining in the most exciting hotel in the world you expect the food to be nothing short of spectacular, and our tantalizing Abu Dhabi restaurants showcase the finest specialties from around the world. Choose from a colorful host of eateries, from the freshest seafood and sushi to modern Italian, regional Indian cuisine, and a stylish array of bars and lounges. For fantastic cuisine throughout the day, we have the perfect Abu Dhabi dining spot for every taste. This city business hotel enjoys an idyllic setting on Yas Island. The hotel is just a 7 minutes’ drive from the airport, a 20 minutes’ drive from the heart of the enchanting city of Abu Dhabi and a 45 minutes’ drive from the heart of the mesmerising city of Dubai. This high-class hotel is specifically designed with business and leisure travelers in mind. The guest rooms feature functional space with ergonomic style that all guests will appreciate. The hotel also offers a luxurious business class floor with a fully-furnished lounge to appeal to the more discerning guest. The hotel also provides first-class business and conference facilities and amenities. Guests can experience the ultimate in relaxation with aromatherapy sessions and treatments in the Spa, which they can enjoy on their downtime. All prices and products subject to availability at time of booking.